A few weeks ago, coming down from Carrauntoohil and Cnoc na Toinne and making my way back to Cronin's Yard, I fell in to the company of a very knowledgable Corkman - obviously a very experienced hill walker. 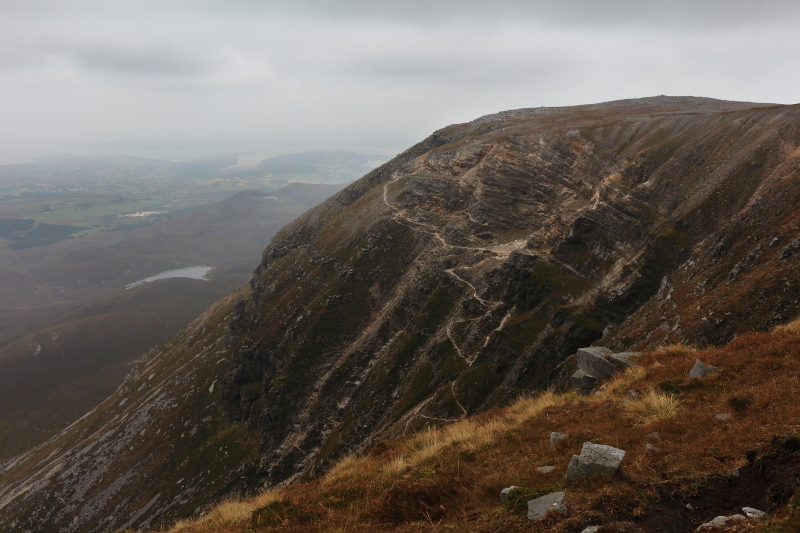 He had walked many of the mountains in my own northern end of the country, and was particularly effusive about Muckish. As he clearly knew his stuff, I resolved to tackle Muckish sooner rather than later, and now know that he was right - Muckish is a particularly brilliant mountain. The routes have been well described here, so I can't add much. i took the southern route, parking at the shrine, the steep climb offering increasingly good views of the rest of the Derryveagh mountains. The plateau at the top is magnificent, with a covering of rock, and many cairns, some very impressive. In addition to visiting the large cairn in the middle of the plateau, the trig pillar, and the large cairn at the eastern edge with the cross, I would strongly advise leaving time to wander round the western and nothern sides too. There are fantastic views to be had over north and west Donegal, even if it was very hazy on my visit. One spot offered a great vantage point to look across and down at the Miners' Track. It looked so impressive that I descended part of the way down. The steep, winding path was a great experience, and the abandoned mining equipment was very interesting.